I’m 32 and I still read comics! My mum must be so proud. Well hopefully I’ll avoid socks and sensible grown up presents and someone will get me a comic. If you see me about feel free to buy me a beer. 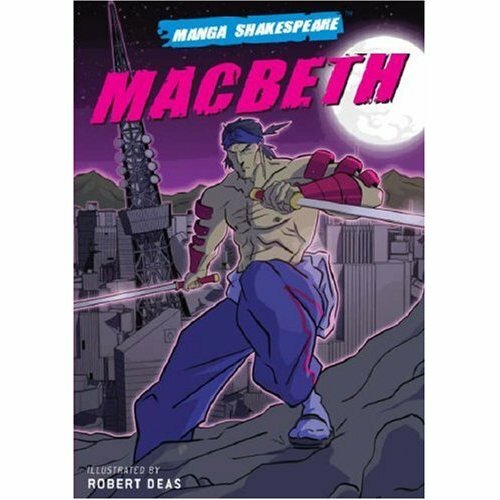 Robert Deas’ Manga Macbeth is a refreshing change. For those of you who don’t know I teach English and I’ ve had to endure teaching Macbeth for years. So to say the play is a bit stale for me is an understatement. Deas has revitalised the story for me. To see such a familiar story alongside such vital art is a treat. Its a bit like waking up and re appreciating the view from your window. The violence and ambition of the story unfolds across the pages and Macbeth’s fall while totally re-imagined is at the same time completely authentic. I’ve waxed lyrical about Deas’ work before and I’m unashamedly a fan so I’m a wee bit biased. However, as I mentioned when I first reviewed a couple of the Manga Shakespeare titles, I wasn’t expecting to like them and I thought they’d just be a sales gimmick. Fortunately I’ve been proven wrong as this is a well considered project that has showcased some excellent talent. If your last experience of Shakespeare was being bored in a classroom this will change your mind. On the other hand if you like well executed manga from an excellent artist then you’ll like it too. I’ve just finished my Hulk marathon and I’m blown away. Planet Hulk and World War Hulk made for an entertaining weekends reading. Greg Pak has revitalised the character for me. For a long time the mean green had become for me a disappointing comic that traded on past success. Well not anymore. The series blends what is best with the Hulk of old and throws in the good bits of Conan and John Carter of Mars. Its a rip roaring testosterone soaked adventure and I found myself loving every minute of it. Don’t get me wrong the writing had flaws ( you could tell that Hulk and Caiera would end up together from the clumsy tension when they first locked heads) but its the kind of story where you strap yourself in for the ride and ignore the occasional bump. World War Hulk just offers more of the same and it has to be said it was worth seeing all those overly smug heroes taken down by the ultimate grouch. Now it’s out in prestige format its worth shelling out to have it all in one place, your bookshelf.